1.2 But Can It Cut Full 24 Inch Tiles? 1.3.1 The tile cutter handles. 1.3.2 Less Complicated over Sigma, Montolit Tile Cutters. 1.3.3 The Cutting Blades of Rubi Tile Cutters. 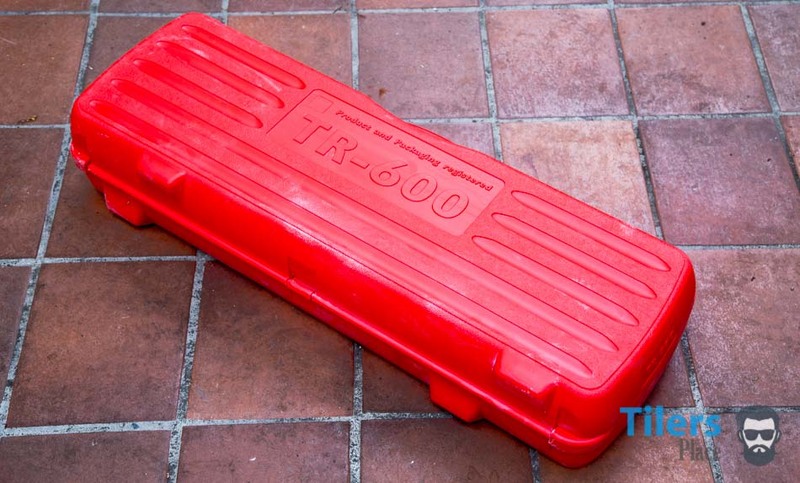 I review the new TR-600 Magnet Tile Cutter made by Rubi Tools to see if it lives up to the high standards that Rubi manual tile cutters have set in the past. It’s the latest update in the Rubi TR-S tile cutter line featuring 200kgs more breaking power in the same sized package and a revolutionary new Magnet system that allows for one-handed operation. Are the new features game changers or mere gimmicks to sell more tile cutters? 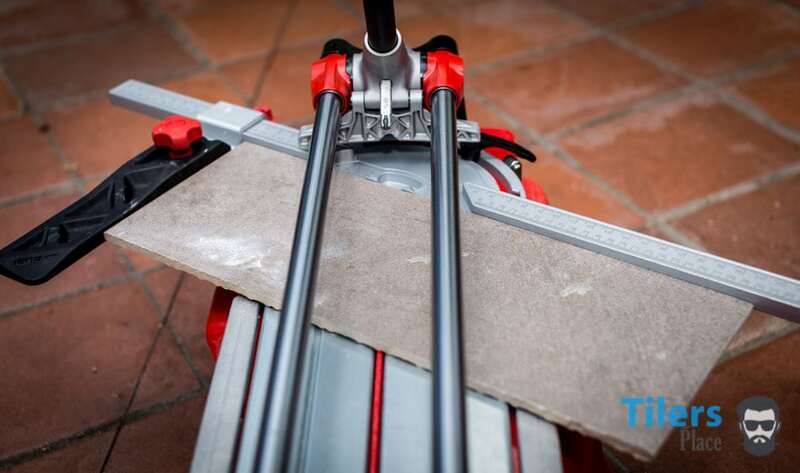 The Rubi TR-Magnet will take on the gruelling task of being my main snap and score tile cutter as I find out if these features live up to the task of making it a true professionals tile cutter. Will the Rubi TR-Magnet handle the pressures of the job or will it be crushed beneath them like a cheap QEP Tile Cutter? Read on and find out as I take the Rubi TR-Magnet to work! Tile cutter was purchased with the reviewer’s own money and has no association with Rubi. All thoughts and opinions are my own. All Images bearing the watermark of Tilersplace.com are taken by the reviewer and property of Tilesplace.com. Before we start the review, let’s take a look at the Rubi TR-Magnet manual tile cutter specifications. 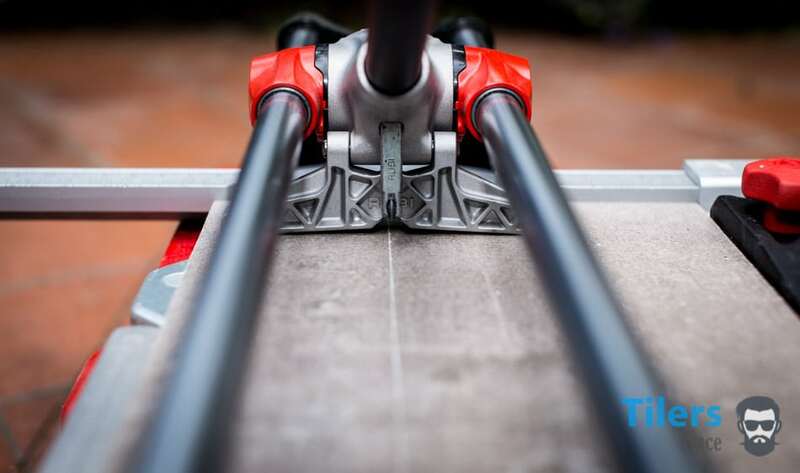 Do note that although this review is about the Rubi TR-600, it will still apply to the TR-710 tile cutter as they are the same tile cutter except the 710 is larger to accommodate bigger tiles. Separating power and features remain the same. If you are looking at purchasing the TR-710 Tile Cutter, this review still applies to you! Tilersplace.com, the only website to bring you in-depth tile cutter reviews with poems and animated GIFS! 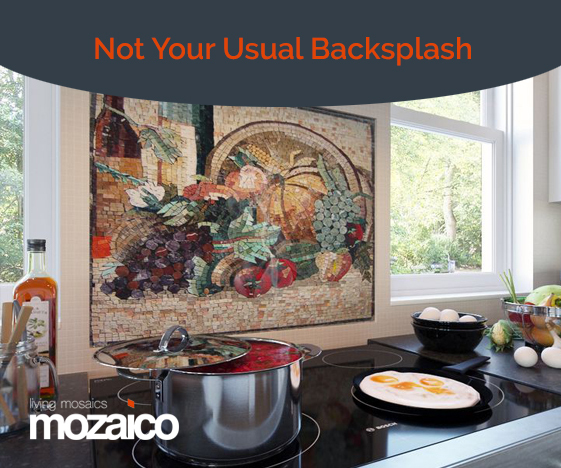 Ability to cut ceramic, porcelain and mosaic tile. Reinforced components result in increased breaking power. Built-in central pivot swivel square for quick and precise measurement of angular cuts in the -45º to 0° to 45° range. Solid steel guides- chromed and rectified, with anti-corrosion treatment for greater resistance to bending and increased reliability. Lateral stop for repetitive cuts – set a size and go. Interchangeable scoring wheels available between Ø 6mm -22mm for all types of tiles. All these features boil down to this, this porcelain tile cutter will cut accurately day in and day out. You can trust that it will cut your tiles perfectly straight and if you set a size, you can rip how many tiles you need to that set dimension. It will cut any porcelain tile you encounter without taking chips out of the glaze and breaking it into pieces. This is a tool for tiling professionals. You are paid to do the very best job and so your tools need to reflect this. 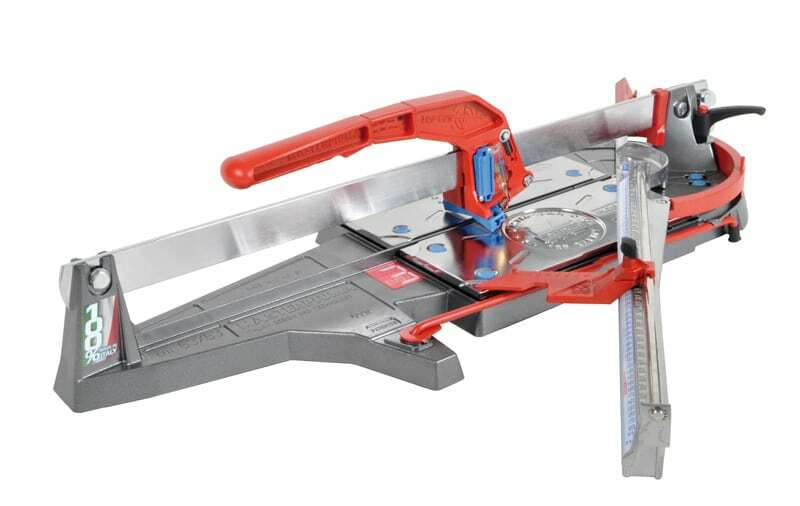 There is a very strong reason why these Rubi manual tile cutters are priced the way they are. You are paying for the utmost standard of quality that will keep on performing for years to come. Do not be fooled by the countless tile cutters listed on Amazon that sell for $100-200 as they are made with the cheapest of materials and mass produced in China or Taiwan. Any of those tile cutters will not last a month of use and the fact some say that they are professional tile cutters is simply ridiculous. • Exceptional build quality and design. • It’s not just a ceramic tile cutter. It’s also a porcelain tile cutter, perfect for tough, modern tiles. • NOT MADE IN CHINA! • Size – with the swinging crossbar it takes up a lot of room in the work area. • Weight – lugging it out of the work truck every morning is never fun. Seriously, the con section is almost comical in this review as there aren’t any real ones. All the cons are reflective of this tile cutters abilities. It needs to be large in order to fit large tiles and it has to be built of powerful metals in order to produce the 800kg breaking strength which makes it heavy. These things are just the price we pay to have the very best porcelain tile cutter, no one ever said tiling is easy and heavy lifting is just par for the course of this business. Even the best tools need to be retired at some point, either they stop being as effective as they once were, the materials have worn away, or you simply want to try something new for a change. For me, it was all those things. I had been using the Rubi TS line of ceramic tile cutters for over 10 years as my main ceramic/porcelain tile cutter for small tiles under 50cm’s in length. Anything from ceramics, mosaics and porcelain felt the Spanish precision of my tile cutter as I used them day in and out for thousands of tiling jobs. I was never let down by the simple yet effective ceramic tile cutters that were as robust as they were effective and when one reached retirement, I went and purchased a new one. 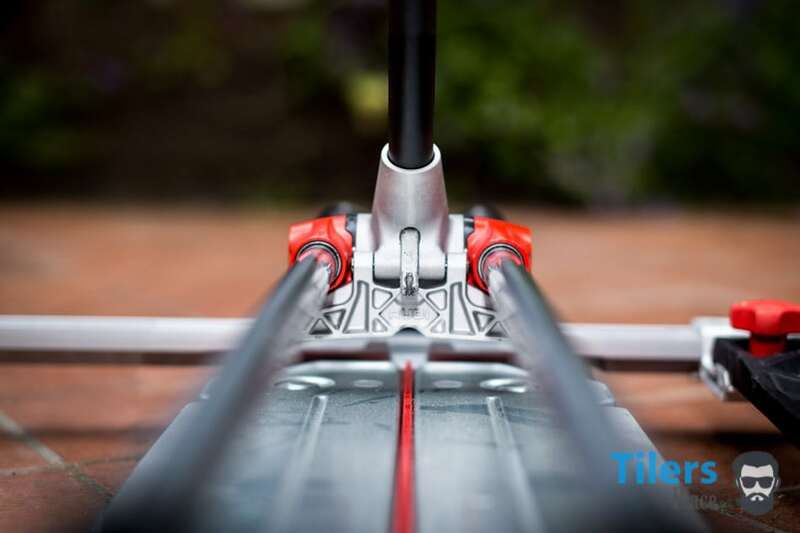 As old as the TS-line of snap and score tile cutters is, the design has managed to keep up with every-changing tile trends and materials, and even though tiles have gotten thicker and tougher, the Rubi TS still managed to snap em cleanly. So when it was time to retire my latest Rubi TS-50 tile cutter, my initial plans were to simply get a new one. My Rubi Star tile cutter that I had previously reviewed got sold to a buddy after he fell in love with the thing on one job. Coming from a former Montolit fan-boy, it was a welcome surprise to see him enjoying the Rubi tile cutter. So with only my Rubi TX-900-N left in the stable, I needed a small tile cutter to handle those merciful jobs that didn’t involve large format tiles. While I was initially thinking of just getting another TS-50 tile cutter, a part of me wanted to try something different. Having already learned my lesson that any tile cutter wearing the QEP, Brutus – or whatever other names the Chinese slapped on their tile cutters – were utter garbage for professional tiling use, I went straight to Rubi Tile Cutters. I wanted a Rubi tile cutter that was in the 50cm range to handle the smaller end of the tile size spectrum and after doing a little research and hands-on playing, I chose the Rubi TR-600 Magnet porcelain tile cutter. I admit, at first I was a bit concerned about the size and weight of the Rubi TR-600. 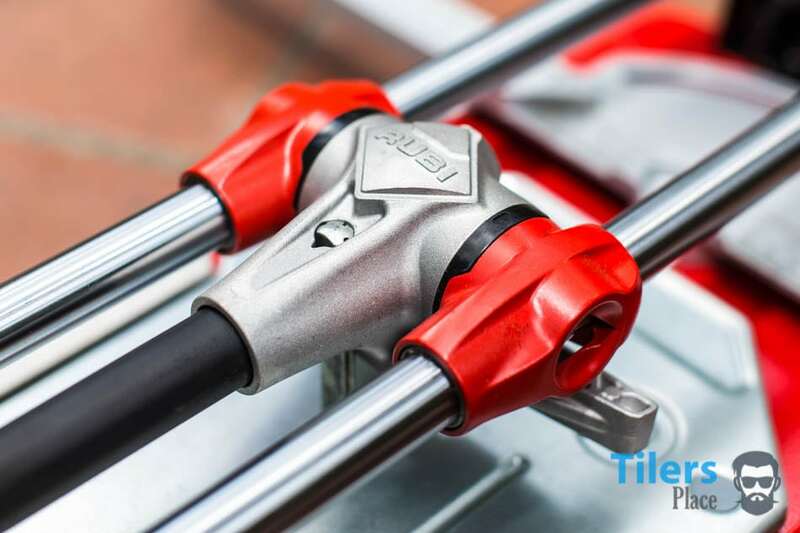 The Rubi TR line is designed for heavier tiles and boasted much larger breaking power over the lighter and more compact TS tile cutters and the TR-Magnet is the latest model in this series. The TR-Magnet is the updated version of the Rubi TR, containing many of the same parts but with boosted breaking power and the magnet breaking head that allows for one-handed tile cutting. So at first, I was thinking that maybe the TR-Magnet professional tile cutter was a bit overkill for the work I need it to do as it was overlapping the skill set of my TX-900-N porcelain tile cutter. What sold me was the fact I could now cut those ever-popular 12x24 inch porcelain tiles (30x60cm) without breaking out the big boy TX-900-N. That hulk of a tile cutter needs a lot of room to set up and was overkill for the 12x24 tiles I am commonly working with. Rubi has done away with the traditional drop lever system on it’s mobile breaking system that was featured on the old TR and still resides in the TX line of porcelain tile cutters. Instead of having to drop the lever to cut break a tile, you simply lift the large handle up slightly and the magnet release and drops the breaker bar neatly in place. The same handle you used to score the line has now become the breaking lever. Simply press down and break the tile in two. Just like any other score and snap tile cutter. To reset the breaker bar for the next cut, you simply raise it back with your hand or tug your arm back. The magnet catches the breaker bar and you are ready to score a tile once again. It’s a damn clever peice of engineering and it works really well for quick tile cutting. This is easily the most satisfying Gif I have ever seen or created. Tile cutter heaven right here fellas. This simplicity and great function carry over to any type of tile I ended up cutting with it. As the months went by with the Rubi TR-Magnet, it scored and snapped any sort of tile I threw at it. No matter the thickness or material. The rest of the Rubi TR-Magnet is nearly identical to the TR line of cutters, hence the model name. It is a Rubi TR tile cutter, it just has the new magnet system and a quick release back plate. The backplate is no longer held onto the tile cutter via a red knob that required tightening and retightening after each cutting session. Following the idea of speed and simplicity, the backplate is now tightened with a spring-loaded quick-release tab that allows the backing plate to slide to various angles or being released all together, in a matter of moments. Simply pop it up with a finger and you can adjust the backing plate to your desired angle or lift off the plate all together to allow the cutter to be fitted back in it’s case. It took me a moment to figure out what was going on here, the first time I took it out of the box, but quickly that little light dimmed in my head and I worked it out. It’s another great piece of innovation and I can’t say any ill towards it. It is simply taking what was good before and making it better and quicker to use. It’s the tile cutter 2.0. 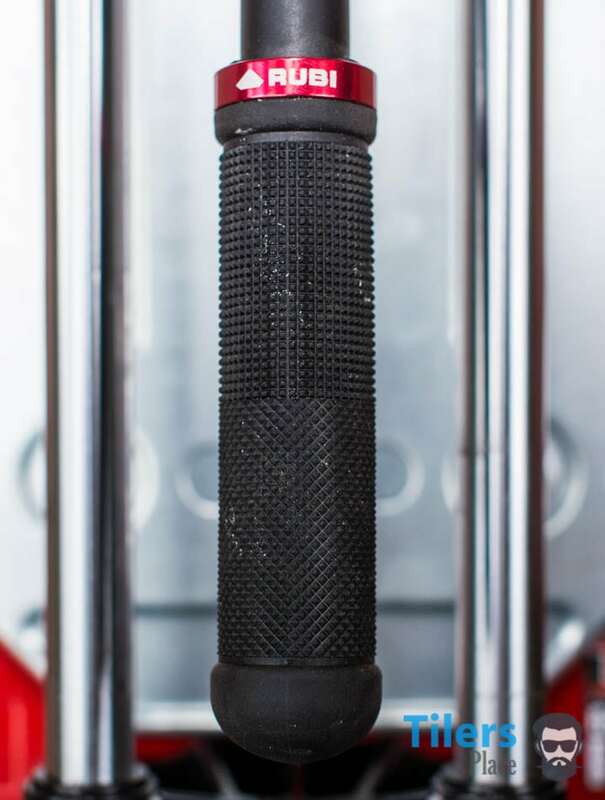 Apart from the new design elements of the Rubi TR-Magnet, everything else is traditional Rubi quality. Rubi Tools has been making tile cutters since 1951 and their experience as the inventors of the first tile cutter truly shows in every tile cutter they release. The TR-Magnet is no exception. It’s a stunning combination of form and function with its striking tri-tone color scheme and sleek design. Anyone can tell that this is a professional tile cutter and it’s one of the best tile cutters currently available in this size. Nothing negative can be said about the materials used or the build quality of this tile cutter and it’s all backed up by a 5-year warranty. The best a QEP tile cutter can do is one year. All this is wrapped up a traditional Rubi hard case cover that keeps your precision instrument safe and calibrated no matter how rough the road to your next job site is. 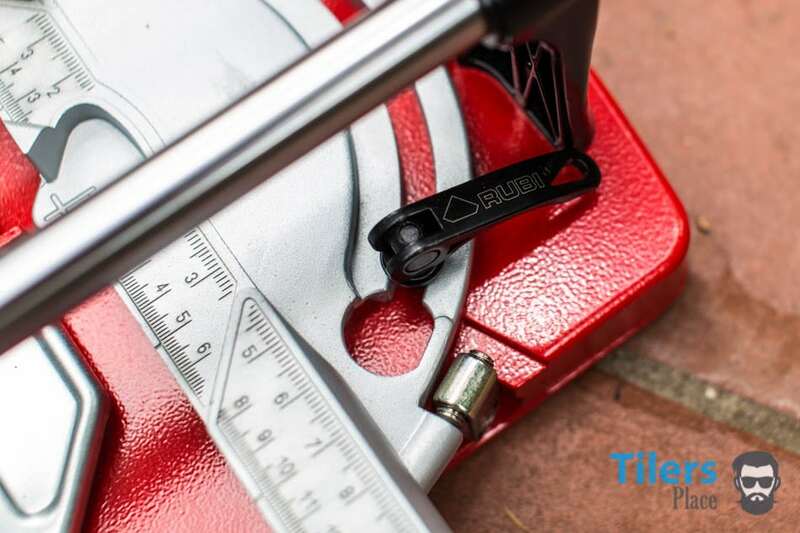 I see a porcelain tile cutter as a precision instrument like a set of calipers, with its twin rods ensuring every cut is perfectly straight to a 90° angle, you need to keep it safe. The hard case that comes with the Rubi TR-Magnet does that and gives you the excellent piece of mind that your investment will be straight for years to come. So my first impressions of my new Rubi tile cutter were altogether positive. The learning curve of the new features was a fun one as I learned how to operate the latest trick up Rubi’s sleeve and as I used it in the months to come, I began to love the Rubi TR-Magnet more and more. There is a certain power in a brand new tool of the trade that can make one feel like no job can ever stop them, and this tile cutter definitely gave me that feeling. The first morning I lugged it out of the bed of my Ram pickup, I knew the day was gonna go great and I was gonna slay those tiles. Popped open the red carrying case, set up my brand new porcelain tile cutter and wowed the hell out of the homeowners. What’s there to say besides over exaggerating a day that went smooth as silk. I knocked out a kitchen, laundry and bathroom floor in one day using the Rubi TR-Magnet. The magnet system performed without missing a beat and the massive handle packed so much breaking power, the 12x24 porcelain tiles I was laying didn’t stand a chance. They broke clean, straight and without any wastage all day. Did I mention I only had to use one hand? Apart from setting up the tile, the scoring and snapping is entirely handled by one hand. 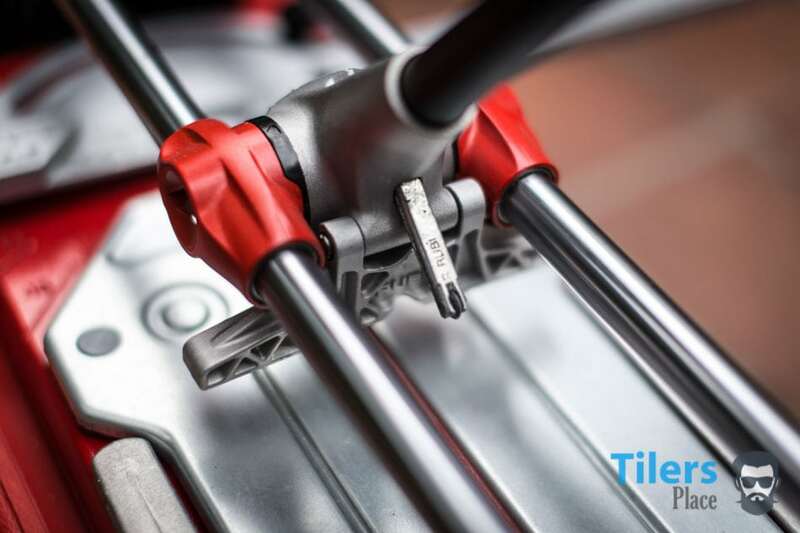 Gone are the days of having to reach over the tile cutter to reach the breaker bar like the Rubi TS, now you can do it all with one hand, besides the simplicity, this increases workflow and cutting speed dramatically. The newly designed lateral stop is easier to use as well, with a large plastic stopper that can be set straight or to a 90° angle depending on the size of the cut you require. The Weeks Goes By And I Learn Some Tricks. Over the coming weeks and months, I experienced cutting a myriad of different tiles with the Rubi TR-Magnet tile cutter and learned how to get the most out of it. The main thing I learned is that this is a very powerful porcelain tile cutter and that super-sized handle can very easy pulverize smaller tiles while scoring them. You do not need to lean so hard on it during scoring, your scoring strength is dramatically increased thanks to the length of the handle, so you can go easier on it during scoring. This is prudent to remember, especially when cutting subway tiles or 12x12 inch porcelain tiles or smaller. This change in scoring was by far the biggest change and skill I needed to learn during my initial training with the new porcelain tile cutter. After that, it was smooth cutting all the way. On one job I was brazen enough to try cutting heavily textured 12x24 tiles, something I usually left to my handheld tile saw. I scored the tile a few times to make sure I got into every crevice, dropped the handle and boom, beautiful straight cut. Instantly my work speed had doubled since now I didn’t have to make every cut manually on the handheld tile saw. The Rubi TR-Magnet ceramic tile cutter was quickly paying for itself. But Can It Cut Full 24 Inch Tiles? I don’t know about the tile trends that are currently the next big thing in your area, but I bet you have laid your fair share of 24inch (60cmx60cm) tiles since they first arrived on the scene. Personally, I hate these things and need to have a word with the designer who thought oversize tiles should be the next big trend in tiles. Once the full 24-inch tile hit the market, they opened the floodgate for all manner of large format porcelain tiles that kept getting bigger and more ridiculous as the years moved on. Now there are tiles don’t won’t fit into the bed of my Ram pickup, and if something can’t fit into the back of a full-size pickup truck, you know you’ve gone overboard. I’m lucky enough to work mainly with the “smaller” 24-inch tiles in the jobs that I do and so tile cutters like the Rubi TX-900-N is more than adequate for those and slightly bigger tiles. Since I already own a tile cutter for large format porcelain tiles, I never even thought I should use my Rubi TR-Magnet to cut 24-inch tiles. I used it for the common 12x24 inch tiles and it worked great every time but for some reason, I never did the obvious thing and tried a full-size tile. That all changed when one day I was simply too lazy to lug out my heavy Rubi TX-900 from the truck and instead took the Rubi TR Magnet. Set it up, slid a full 24-inch tile in and surprise surprise, it fit great! The support arms on the side of the cutter also helped stabilize the bulk and kept it steady during a cut. Speaking of the cut; it did it great! The TR-Magnet excels at cutting thick, tough tile really well. I think it cuts thick tile better than it cuts thin tile which sounds funny but it’s true. You can imagine my surprise when my medium sized tile cutter was slaying these 24-inch tiles without any problem. And this wasn’t a one-off thing either, I completed over 100 square feet of 24 inch tiles only using the TR-Magnet 600. After that revelation, I used it for more jobs involving 24-inch tiles and it performed just as well. This tile cutter has severely reduced the workload of my TX-900 as it can cut such large tiles that only the TX-900 could cut before. So if you are looking for a tile cutter for 24 inch tiles or a tile cutter for large format porcelain tiles, definitely consider the Rubi TR-Magnet. It’s smaller size compared to other porcelain tile cutters will make working in cramped conditions much easier, won’t be such a burden to carry around and most importanly; it can cut 24 inch tiles effortlessly! 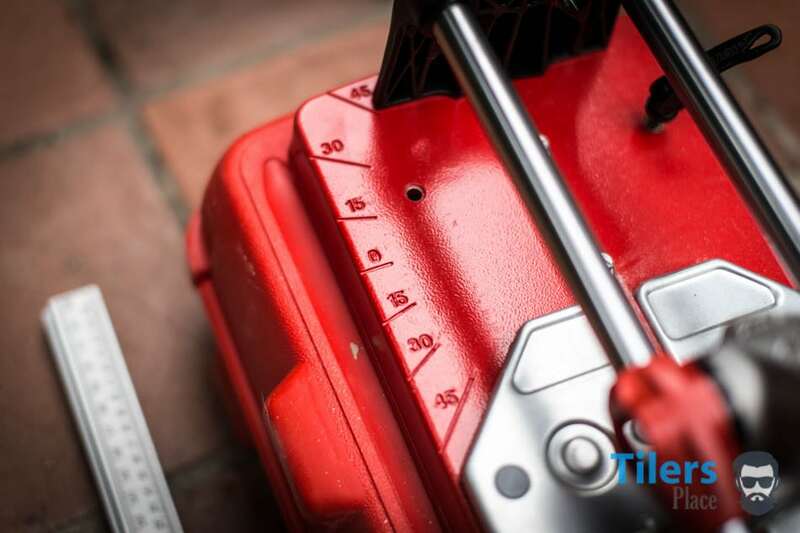 If you are new to professional tile cutters and are thinking about taking the plunge and investing, I want to tell you why I personally prefer Rubi tile cutters. In the professional tile cutter game, there are three main players: Rubi Tools, Sigma and Montolit tile cutters. I see it as a battle of Chevy vs Ford vs Ram pickups. Everyone has their favorite preference as the unique features of every brand best suit them for their ceramic cutting tool of choice. Some guys like barbeque sauce, some like ketchup while others swear by chilli sauce. In saying that, there are some guys that use both Sigma or Montolit and Rubi tile cutters, using different sized models for different tiles. I raise my hats to you legends, you are going beyond brands and getting a quality job done. Anyway, what I’m trying to do is show you some positives of why Rubi Tile Cutters are my secret sauce in the tiling game and why I believe you will benefit from adding one to your bag of tricks. I have personal experience with all three tile cutters and can safely say that all of them are superior tile cutters to the likes of QEP, Brutus and Happy Buy ceramic tile cutters. They are all built of top quality materials, designed for the professional tiler and will last longer than a week. Sadly it appears internet reviewers do not see this as other websites reviewing tile cutters say that the best tile cutter is a QEP 24 inch tile cutter. Yeah, and pigs fly and I will become Governor of Georgia State. Sure. Just do your best to ignore those sites as I truly doubt they ever actually cut a tile with a tile cutter, let alone seen one, apart from pictures online. The ranting aside, with experience using Rubi, Sigma and Montolit tile cutters, why did I end up choosing Rubi as my tile cutter of choice? Unlike both Sigma and Montolit that feature a single rail and a bent handle that both scores and breaks, I found the straight handle of the Rubi tile cutters to offer the best all-day comfort. If you find yourself with a large job and are cutting tiles all day, every day, the strain of scoring and snapping tiles ends up in your wrist, to the point where you can’t move it anymore. This is especially pronounced with thick tiles that are tough to break, forcing you to squeeze the handle and center rail together to even get the thing to pop. If you are doing that all day, even a cyborg with titanium steel wrists will begin to feel the strain. I was subbing with a guy that had a couple of Sigma’s and we were tiling the whole entire reception area, bathroom and utility rooms of a heliport. There were cuts aplenty, especially in the long corridors and in the bathrooms. Well, after a week of that my wrist had it and I was in the hospital getting my wrist x-rayed. I can hear you yelling it at your PC’s and smartphones while reading this and trust me, I was thinking the same thing. Even my wife said it for Pete’s sake! Guess what, I found myself using a Sigma tile cutter a few months later and the same problems resurfaced. I couldn’t play the banjo for a while after that, life lost its lustre. Feeling like an idiot, I chatted up the guys at tile stores and other fellow tilers and asked them if they had any issues with the crooked handles of the Sigma and Montolit tile cutters. While the younger guys said they didn’t mind so much, the more experienced grey-hairs were nodding in agreement and pointed out those crooked handles. As it turns out, the crooked handle forces a different angle on your wrist and makes it do more work than if you were using the straight handle of the Rubi tile cutters. The handle on the Rubi tile cutters allows your arm to do the heavy work while your wrist simply guides it. So if you are scoring tiles or snapping thick porcelains, a lot of that strain is removed from your wrist as it’s left straight and out of the tension point. After 25 years of using Rubi ceramic and porcelain tile cutters, I can honestly say I have never had problems with a sore wrist or arm from using them. The Rubi tile cutters also feature a bigger breaker bar over the others, usually double the size in comparison to their same sized counterparts. Wider breaker bars distribute the force more evenly across the surface of the tile and help in creating a clean cut. Check out this short clip of me cutting a small strip off a cheap porcelain tile. The shards flying off made for some dramatic video! The video also shows the power of having a mobile breaking head, as I was able to apply pressure to both the top and bottom of the porcelain tile to get a clean break. The Rubi TR-Magnet proves again it’s an amazing porcelain tile cutter. Less Complicated over Sigma, Montolit Tile Cutters. Take a look at a Rubi tile cutter and you can easily see what every part does. There are no unnecessary bits to complicate the action of the tile cutter or anything getting in the way. Another factor that I previously mentioned in my other Rubi tile cutter reviews is that they contain fiddly pieces that can be damaged easily. There are no springs in the handle, no delicate capsules of lubricating oil to ensure the blade keeps turning during cuts. You can throw a Rubi tile cutter off a roof and it’ll keep going without issue. It probably won’t cut as straight, but it’ll keep going. I hesitate to say the same about Montolit or Sigma tile cutters with their multitude of springs and locking levers. 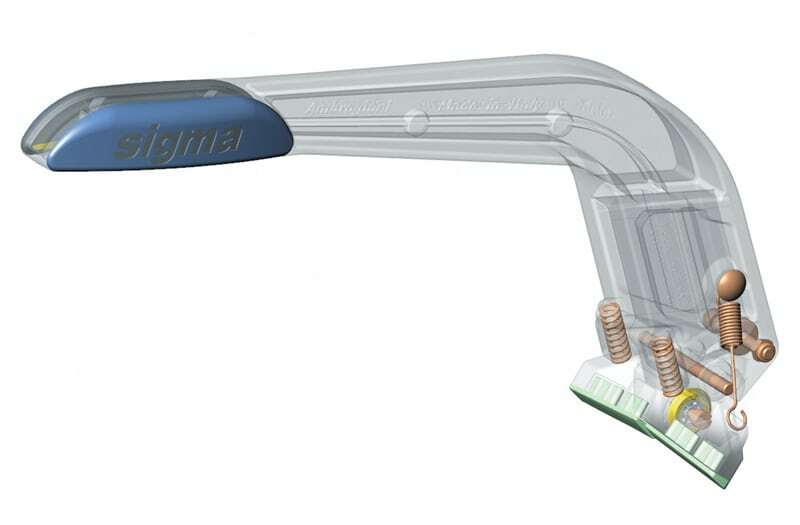 Sigma isn’t as bad as Montolit in this regard but their designs are very similar, it’s just that Monti tile cutters seem as complicated as a 70’s Ferrari V12 engine. For instance, Rubi tile cutters do not require the aforementioned lubricating capsules to be fitted in their handles to keep the cutter blade from jamming up. You just give the blade and the rails a quick squirt of WD-40 or CRC and it’ll keep cutting all day without any stopages. Most of us always have one of these cans of lubricant kicking around our work horses and so it’s not an additional item we need to stock up on to get the job done. Some might argue that the magnet system on the new Rubi TR-Magnet is a gimmick and overly complicated with a part that may fail. In my 6 months of using the TR-Magnet porcelain tile cutter on a nearly daily basis, I have yet to see evidence of this. Apart from the usual dirt and thinset stains, my tile cutter is working as good as it did on it’s very first day. So in my experience, no the new system isn’t proving to be overly complicated or gimmicky, it’s just streamlined the tile cutting experience with newer engineering. The Cutting Blades of Rubi Tile Cutters. All of Rubi’s ceramic and porcelain tile cutters (excluding the TP-S) make use of their patented scoring blades. These are specially machined rods that slot into a Rubi tile cutters handle section and tightened in place. The scoring wheel is made from hardened tungsten carbide and can score the surface of any tile including glass. This versatility is what separates Rubi tile cutters from everyone else. QEP, Brutus, Sigma and Montolit all use only one type of carbide wheel that screws into the handle and has to cut everything. Rubi Tools understand that there is a myriad of tiles out there and making a tile cutter for ceramic cutting only just wouldn’t do for the inventor of the tile cutter. These scoring wheels come in different diameters and are specially suited for different tile finishes. From plain ceramics to textured porcelains, these blades allow you to cut them all with the same tile cutter and get great results each time. 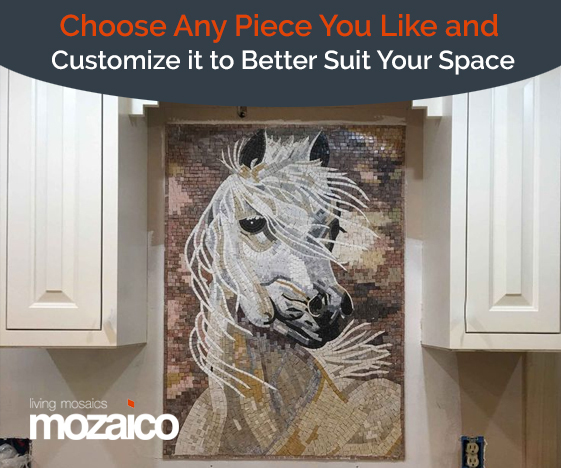 Instead of having to dissamble the tile cutter and add on other pieces or use a different tool altogether, you are given the versatility with the one tool. Just buy any size for your model and see how you like it. Chances are, you’ll be perfectly happy with the one size and keep using it for months, the only time you’ll be switching it is for a fresh blade. Personally, I follow the suggested size guide loosly, as I have found over many years of experience that all Rubi scoring blades cut equally as well over a range of tiled materials. 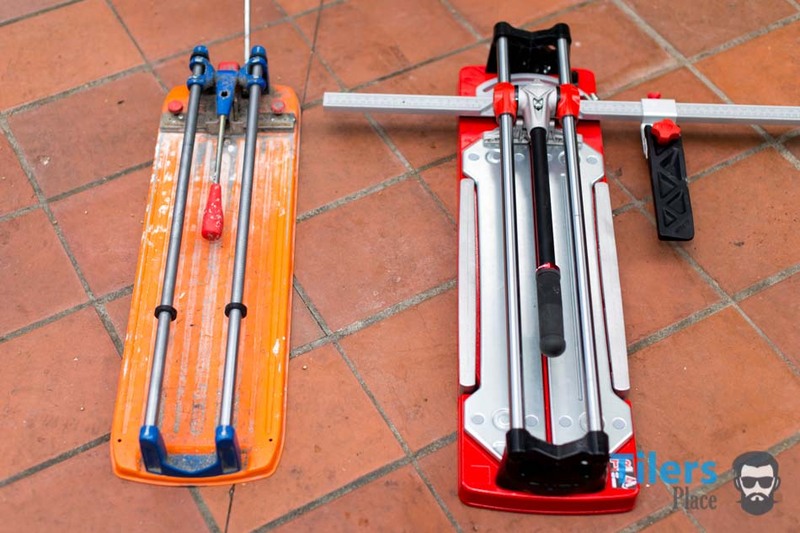 The main thing you need to watch for is what Rubi tile cutter system they are made for. On the packaging they usually say “TM,TX” or “TS,TF,TR” and this tells you for which system the blade will fit. 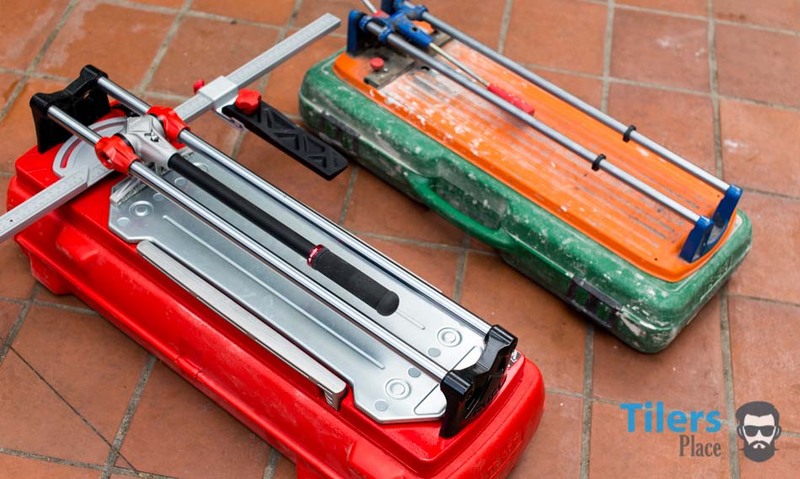 If you are using a larger tile cutter like the Rubi TX-900-N then the TM,TX system of scoring blades are for you. To view the entire range of Rubi scoring blades, you can click here. The Rubi TR-Magnet uses the smaller TS,TF,TR range of blades. It’s easy to make a mistake if you don’t observe the packaging but if you stick to Rubi tile cutter systems you’ll end up using both types of blades for your various tile cutters anyway. I keep a stock of both types in my pickup and don’t have a worry. I’ll include a link to a nice box set of Rubi scoring blades for the TR-Magnet that covers the sprectrum of different sizes you might require for any job. 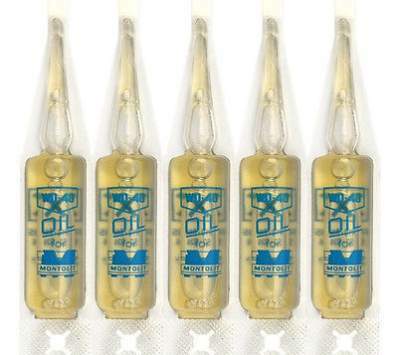 This box set should last you atleast a year if you keep them well lubricated. Those are the main differences that make me prefer Rubi tile cutters over any other system. Take a note of them and use your own diligence to decide which system would be right for you before you take the plunge. Every system carries its unique advantages and strengths while remaining similarly priced so it comes down to what you feel would benefit your business the most. 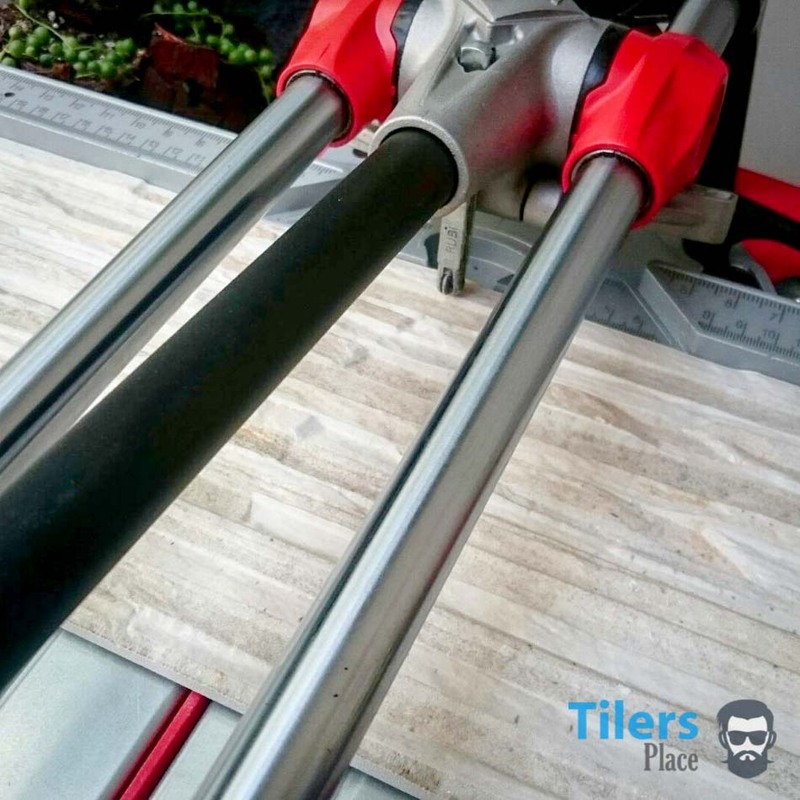 It’s no secret which system I carry the flag for, I wouldn’t have written thousands of words in these tile cutters reviews if I didn’t like Rubi tile cutters now would I? For decades they have provided me with a reliable and effective way of cutting tiles and I would like to pass on that same great experience to anyone that reads this. THEY MAKE YOU LOOK LIKE A BOSS! After my old Rubi TS-50 reached retirement age, I was aiming to replace it with another of the same model. 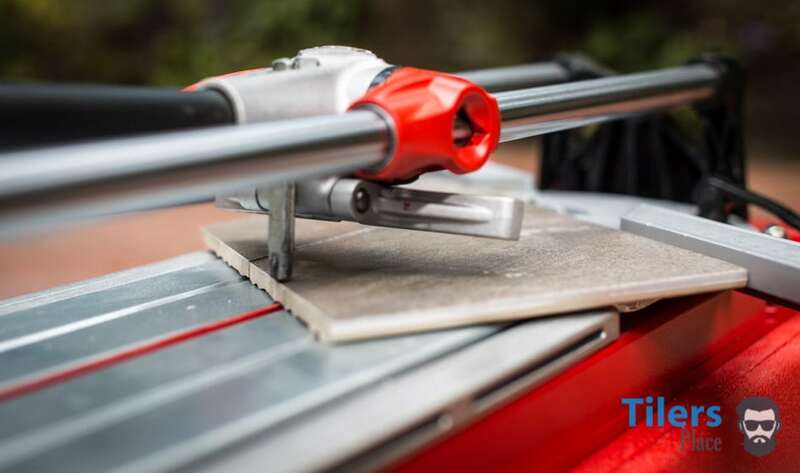 However, in later years, Rubi Tools have made vast advances in the porcelain tile cutter technology and produced a vastly superior and streamlined tile cutter in the form of the TR-Magnet. Coming in two models: TR-600 and TR-710 to suit different sized tiles, I opted for the smaller of the two. With it’s improved breaking power and ability to cut popular tiles like the 12x24 inch, it was the right fit for me and my business. The increased weight and size of the Rubi TR-Magnet did prove to be a hindrance in comparison to my smaller and lighter TS-50, however, the incredible power and speed of the TR-Magnet quickly made up for it. 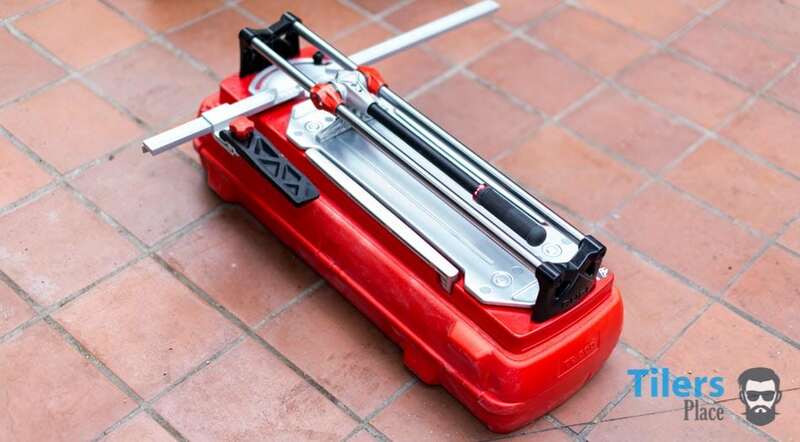 Anything from small brick tiles to full 24 inch tiles can be cut with this tile cutter and with the versatility of the Rubi scoring wheel range, I can get a whole lot done with just one tile cutting tool. To make the transition even easier, the Rubi TR-Magnet uses the same TF,TS,TR scoring blades that my old TS-50 used, so my stock of scoring blades could all be used with the new tile cutter. If it’s a modern and reliable tile cutter that you are looking for, that can cut diagonally and straight equally well and won’t break the bank, the Rubi TR-Magnet series of tile cutters if for you. I am one very happy owner of this amazing tile cutter and simply love the magnet system. It’s easy to use, offers clear sight of the scoring line and that massive black handle has a mountain of breaking power behind it. Since the breaker is mobile, you can crack at various points of the tile to get a break on even the most irritable of tiles. If your thinking of buying a new professional tile cutter for cutting ceramic or porcelain tile, the Rubi Tools TR-Magnet should definitely at the top of your shopping list. Looking for a new porcelain tile cutter? Because you have found it! The Rubi TR-Magnet, the latest and greatest tile cutter out there. Take a moment to enjoy some photos of the Rubi TR-600 tile cutter. These were taken by me the day I got it. Before long it started looking like my old Rubi TS-50 ceramic tile cutter! Old and new. The TR-Magnet saying hello to the TS-50 ceramic tile cutter. Old cermaic tile cutter sitting next to the new porcelain tile cutter. The TR-600 Magnet tile cutter ready for action. Angle guides to help you set up diagonal cuts. Angled cut with the side stop set for multiple cuts of the same size. The new pull tab that releases the backplate. The new magnet head that makes the magic happen. The Rubi TR-Magnet porcelain tile cutter uses TS,TR,TF scoring blades, same as the old TS-50 ceramic tile cutter. The Rubi TR-Magnet porcelain tile cutter ready to snap a tile after it scored it. The case that is included with the Rubi TR-Magnet porcelain tile cutter. Keeps it safe during transport. All images © Tilersplace.com 2018. Copying, replication or use on any other sites strictly prohibited. Click here if you would like to purchase the Rubi Tools TR-600 Tile Cutter and receive free shipping! Click here if you would like to purchase the Rubi Tools TR-710 Tile Cutter and receive free shipping! If you are buying your Rubi Magnet porcelain tile cutter, don’t forget to buy some scoring blades! If you think a Rubi porcelain tile cutter is for you, why not check out my other Rubi tile cutter reviews? Review for the Rubi Star Ceramic Tile Cutter – The Best Cheap Tile Cutter. 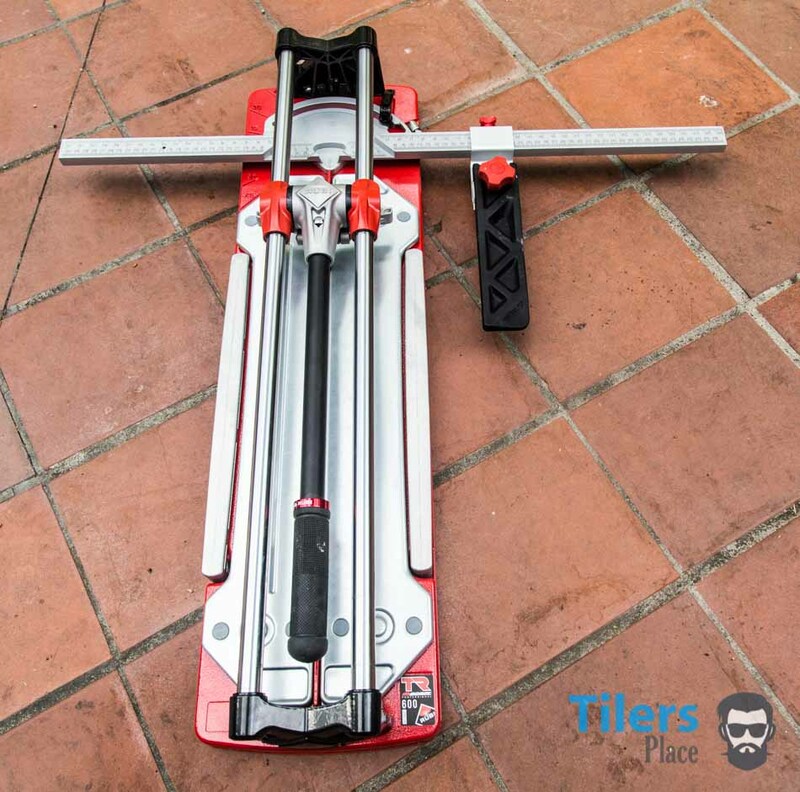 Review for the Rubi TX-900-N Porcelain Tile Cutter – The Best Tile Cutter For Large Format Tiles. Thanks for reading my review of the Rubi TR-Magnet series of porcelain tile cutters. If you found it useful or enjoyed the review, the gifs or photos, please give it a share! It’s a very easy way to help out my site that provides tiling information to everyone, ad-free and for free! 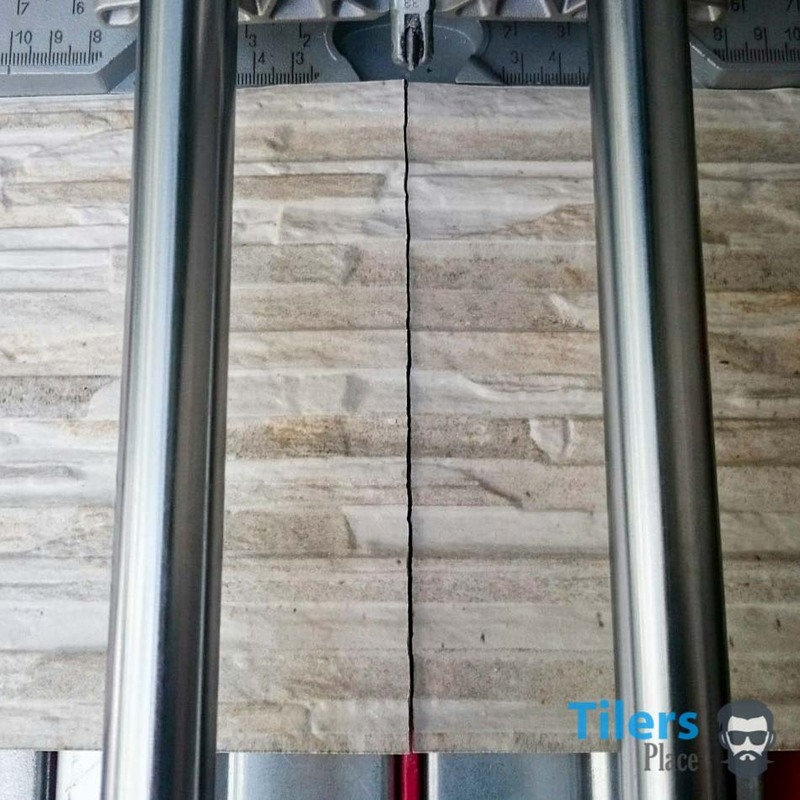 Tilersplace.com, the only website to bring you in-depth tile cutter reviews, tips on grout removal, knee pad reviews and much more! I’ve been using the Rubi Tr-Magnet for over a month now and I gotta say Carl, your review was spot on. It was the first tile cutter I purchased online from a review and I’m glad I did! I’m loving the magnet handle, it really makes cutting any type of tile a breeze in comparison to the old TR’s, just a great evolution. Thanks a lot for the thoroughly entertaining and insightful review, your site is an true asset to the tiling world, haven’t found any other site like it.